These items come with free shipping and insurance! "Evening on the Avenue is a nostalgic look back to a time when families strolled America's Main Streets to mix and meet and conduct business. A clearing dusk paints the scene with a silvery softness as gas lamps and windows blaze gold and amber; rain-washed pavement adds a festive glow. The painting has a symbolic message: the peacefulness and serenity of traditional communities are still the heart of any nation." Evening on the Avenue copyright© 2007 by Thomas Kinkade is prohibited from being copied. 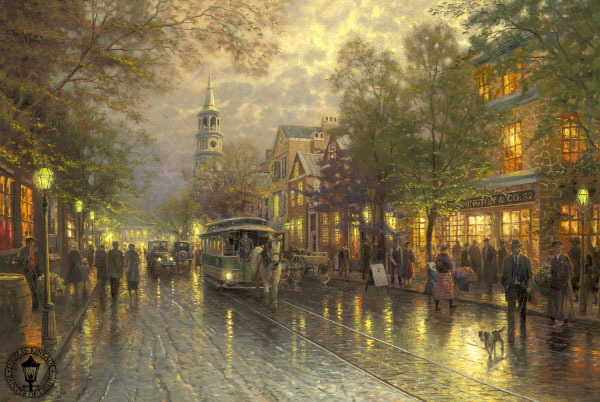 Thomas Kinkade art, evening on the avenue, nostalgic street paintings, city scene, artwork, art work, canvases, images, paintings, pictures, and prints of Evening on the Avenue by artist Thomas Kincaid for sale. 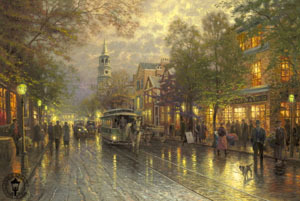 Evening on the Avenue painting by artist Thomas Kinkade can be purchased in art print or canvas form at special sale prices at Christ-Centered Art.